Kade is using Smore newsletters to spread the word online. Buonarroti spent most of his lifetime and around Italy. Bruonarroti's life was mostly based off of education, training, and obviously his art. This devotion to his career is one of the reasons that he was outstanding in his field and why he is commonly considered to be one of the best artists of all time. Bruonarroti was a painter and an architect but mostly a sculpter. The Tomb of Julius II was one of the largest projects for Buonarroti. 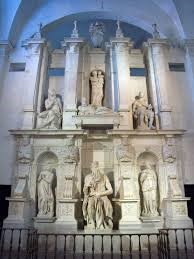 It was built in Rome In the year 1505 by Buonarroti. The Tomb of Julius II was completely designed by Buonarroti and was his largest project. It is a great example of his architecture, painting, and especially his sculpting style and skills. It has over forty statues all with great detail, but yet the tomb stands with honor and dignity. This piece stood out for me because of its size and detail, it is said that the tomb took up the majority of forty years of Buonarroti's life. The intricacy of each statue combined with the over all size of the tomb makes it an amazing piece of art and architecture. The Renaissance "ism" that Buonarroti demonstrated most in his art is humanism. Most of his works were based on the average human and not godly people or religion like in the ancient Greek and roman time periods. WALLACE, WILLIAM E. "Michelangelo Buonarroti." Europe, 1450 to 1789:Encyclopedia of the Early Modern World. Ed. Jonathan Dewald. New York: Charles Scribner's Sons, 2004. Biography in Context. Web. 18 Nov. 2013. "Michelangelo Buonarroti." Encyclopedia of World Biography. Detroit: Gale, 1998. Biography in Context. Web. 20 Nov. 2013.